Many insect species have natural enemies. Often, insects are locked in an evolutionary race for dominance with another insect species — and it turns out that these wars are much more epic than we ever realized, according to a new analysis of insect DNA. Researchers at the University of Edinburgh used the DNA of a bunch of plant-eating insect species and their wasp predators to reconstruct their movement through time. 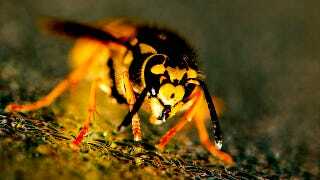 The thirty-one species — 12 plant-eaters, 19 wasps — in the study all originated in either Iran or Turkey about four million years ago, and since then have slowly migrated into Europe. These various species have been involved in a game of cat and mouse — or, if you feel it's weird to use that metaphor in this situation, a game of insect and other insect — for all that time, with wasp species chasing after the plant-eaters. Many of the species are locked in an evolutionary struggle, with both species adapting to stand a better chance of either eating the other or simply surviving the encounter, depending on their natural role. What makes this particularly interesting is how changing climates have shaped and sometimes this disrupted these conflicts. As Ice Ages rolled over Europe, the hardier plant-eaters were able to race ahead of the wasps, effectively separating themselves from their natural predators, sometimes for hundreds of thousands of years. And yet, the wasps, after what I can only assume were countless millennia of aimless, pissed off flying, always manage to find their prey. Once contact was reestablished, the species went right back to their old relationship without missing a beat, as though the hundreds of thousands of years in between had never happened. Considering how quickly these species evolve in response to the other, it's amazing how they apparently don't change at all in each other's absence. This finding potentially has some implications for our response to global climate change, which is likely to disrupt natural prey-predator relationships. The fact that these species thrived when separated from each other and had no problem going back to the old ways might suggest that biological relationships aren't as fragile as we feared, and that insects — who account for half of all the animal species on our planet — might be surprisingly well equipped to deal with disruption to their ecosystem. However, as the researchers point out, ecosystems tend to be more fragmented today than they were millions of years ago, so we may not want to get our hopes up too much on that score.. Via Current Biology. Image by quinet on Flickr.